There is no more effective way to release the power of God into any ministry than by proclaiming His word. God’s word cuts through every situation and I’ve seen people radically healed, delivered and saved through no other means than by proclaiming His word. One of the ways that the Bible teaches us is to take everyday situations and use them as examples in a Spiritual application. Some examples are a farmer sowing his seed, a soldier putting on his armor, a fisherman catching fish with a net and a bride preparing for a wedding. Today I want to focus on the example of constructing a building. There are at least 17 examples of building a house used in scripture and at least 41 concerning building in general. This passage first tells us that we build ourselves up on faith, by praying in the Spirit. It is our job to build ourselves up. These verses tell us that we (the body, collectively) are being built into a Holy temple, a dwelling for God in the Spirit. Here we are compared to living stones being built together into a Holy temple which God is going to inhabit. Here Paul reiterates to the elder of the church at Ephesus that the primary way for us to be built up is through the word of God, the scriptures. Not only does the word of God build us up but it prepares us to inherit the Kingdom with all those that are sanctified. In any building, no matter what the building material, whether it be concrete or wood or whatever, the most vital element of construction is the foundation. The foundation of a building determines the type of structure that can built upon it and sets the limits on what the structure can tolerate and bear. This is also true in the Christian life. We cannot build more of a Christian life than our foundations will permit. Have you laid or are you laying the right foundation? There is only one foundation that is adequate for supporting the proper Christian life, the temple that God will inhabit. That foundation is the living stone, Jesus Christ. The word for ‘master builder’ in Greek is the same as our meaning for the word “architect”, one who plans, designs and oversees a construction project. Here, Paul states very clearly that there is only one foundation for the Christian life and that foundation is Jesus Christ. Any church that calls itself Christian must have as their foundation of the full teachings and Gospel of Jesus Christ. Anything less will not hold up to the test of time or trials yet to come. Likewise every individual Christian must access their own beliefs to assure that they are built on the solid foundation of Jesus Christ. Do you have a personal relationship, awareness and knowledge of Jesus? The question of laying a solid foundation in Christ is crucial to the Christian faith. So, how do we get this foundation of Jesus in our lives? Verse 18 is one of the most misunderstood and mistaught verses in all of scripture – and this is partially due partially to ignorance of the original Koine Greek. When Jesus says to Peter in verse 18, “I also say to you that you are Peter, this is petros in the Greek), and upon this rock (petra in the Greek) upon this rock I will build My church” he does NOT mean that He will build His church on Peter. If the church was built on Peter it would be such a weak foundation that it would have collapsed multiple times before and after Christ’s death and resurrection. Peter was so influenced by the demonic at one point (Matthew 16:23) that Jesus personally rebuked him saying, “Get behind me Satan” and during Jesus’ trial Peter denied Him three times. After Jesus was resurrected Paul sternly rebuked Peter for compromising the truth of the Gospel when preaching to his Jewish brethren. The intention of verse 18 is to say that the church is built on the revelation that was given to Peter from the Father, by the Holy Spirit, that Jesus was the Messiah. Isn’t this exactly what happens to every single believer at salvation? THAT is what the church is built on – the revelation of who Jesus truly is. We get a clearer picture of this when we look at the original Koine Greek. Peter in the Greek is Petros, meaning a single, small stone or rock. This is the word that was used for Peter in verse 18. Further, the Greek word petra means a ledge or cliff of solid rock, a bedrock. This was the word used for ‘rock’ in verse 18. A petros is a stone or small boulder that can easily be moved or dislodged, whereas petra is a solid mass of rock, a firm foundation that cannot be moved. Petros was used to describe Peter because he manifested the characteristics of a small stone – easily moved, swayed – not a firm foundation but a small stone that is not permanent in nature. The foundation of the Christian church is based what happened to Peter before his now famous line in scripture. Peter had a personal relationship and a divine revelation that Jesus is the Son of God, the Messiah and our Savior. The experience of Peter is relived in every single believer at salvation. 1) A Personal Encounter – Jesus and Peter came face to face. There was no mediator; no priest, no Pastor, no ceremony and no special prayer – nothing between you and Jesus. There is but one way to the Kingdom of Heaven and that is through the door, which is not a church or doctrine but only by entering through Jesus. You can join a church, go through a class or religious ceremony and repeat a special prayer of salvation and come out exactly the same as you were before the process. But, when you truly encounter Jesus personally, you cannot help being totally and completely changed. 2) A Personal Revelation – Every true believer will experience a personal revelation granted from God the Father, by the Holy Spirit as to the truth of who Jesus is. In Matthew 16:17, Jesus explains that this revelation is not given by flesh and blood but from the Father. We cannot perceive this revelation by way of our natural senses, instinct, intellect or intuition. This is a revelation that cuts through like a knife, a bolt of lightning and instantly makes perfect sense. No one can truly know Jesus without a personal revelation. You can go to a seminary or Bible college and study til your blue in the face and even come out a minister and minister for years – but without a personal revelation of Jesus and who He truly is in your life you cannot know Him. This is the leading element and reasoning behind Jesus telling the ones that cast out demons and healed the sick, when they stand in front of Him for judgment, “I never knew you” It is absolutely imperative that each of us experience this personal revelation – which comes from the Father, by the Holy Spirit and through the Son. 3) A Personal Response – We must acknowledge what the Holy Spirit has revealed to us. This is not automatic but voluntary. It requires action on our part. 4) A Public Confession – We must publicly confess our faith in Jesus. This is exactly what Peter did when he confessed Jesus as the Messiah and the Son of God. While there are hundreds of thousands of underground churches and millions of ‘secret believers’ around the world today, when put to the test as Jesus did with His disciples, the true believer will publicly confess Jesus as Lord, even in the face of death. In Matthew 10:32-33 Jesus very clearly states “Therefore everyone who confesses Me before men, I will also confess him before My Father who is in heaven. 33 But whoever denies Me before men, I will also deny him before My Father who is in heaven.” If we fail to confess Jesus as Lord in an appropriate situation (i.e. under threat of death or ridicule) then He will deny us before God the Father. I’ve always been the sort of person that makes my beliefs and intentions clear up front. Even as a non-believer I was that way and when it comes to my faith in Jesus as Lord and Savior I’m even more adamant about letting people know where I stand. That doesn’t mean pushy, it just means that if your around me for any amount of time you’re going to know what I believe. That way when something comes up in my everyday life I won’t waffle around about it and those that know me really don’t even have to ask me what my thoughts and beliefs are. I’ll get questions from curious unbelievers, but if they know me at all they know that my answer will always come from scripture, so when they do ask me something they’ll almost always precede the question with “What does the Bible say about…” I think it’s better to be brutally honest up front because it leaves no room for doubt or wiggle room to make my answers conform to the beliefs of the person I’m addressing. It’s much harder to try and explain yourself after the fact, after side-stepping or avoiding the issue, than to be honest up front and let the chips fall where they may. You may have less friends but the ones you have will appreciate you for it. I really believe that every chance we get to witness about Jesus we should take it. We should never hear someone tell us that they had no idea that we were Christian. It should be a known fact – a part of who we are in our everyday walk. This is how we lay the foundation of Jesus in our lives. Can We Know Jesus The Same Way That Peter and the Disciples Did? Did you ever hear someone say “I wish I was around when Jesus walked the Earth. That must have been fantastic.” Well, I’ve got news. Since the true identity of Jesus was revealed to Peter as a gift from God the Father by the Spirit, then we today know exactly the same Jesus that the disciples did and we can have just as close a relationship with Him as they did. It doesn’t matter that He isn’t here in the flesh, that’s not the point. Jesus wasn’t revealed to Peter as the son of a carpenter. That’s the flesh. The revelation was that this carpenter was also the son of the living God, Yeshua Hamashiach! His name literally means ‘Jesus the Messiah’ or ‘Anointed One’. How do we know that we can have the same relationship with Jesus that the men who walked with Him and witnessed all the miracles personally? Because, Hebrews 13:8 tells us that “Jesus Christ is the same yesterday, today and forever.” He never changes. In addition, the Holy Spirit is called the “eternal Spirit”, meaning the same thing, He never changes but is the same Spirit throughout eternity. So, if both Jesus and the Holy Spirit are the same for all of eternity and Jesus was revealed to Peter as the son of God by way of the Holy Spirit, then when we come to salvation we are introduced to exactly the same Jesus that the disciples knew. Who introduces us? The Holy Spirit! Who introduced the true identity of Jesus to Peter? The Holy Spirit! Now, notice that both houses were tested in exactly the same way. The storm that hit the house built on the firm foundation also hit the house built on sand. As we walk in Christian discipleship, we are constantly hit with storms. I’m talking about those that are actively engaged in doing Kingdom work. The storms I’m referring to are demonic attack. Do you know that if you do nothing to further the Kingdom of God on earth, the devil will pretty much leave you alone? You might get an occasional disruption but it’s when we begin to do Kingdom work that we really become a demon magnet. This is why there is such a disparity and lack of understanding of the demonic in the church today. We’ve got some people who have accepted everything that God has for them and are actively engaged in battle, but the vast majority are not – and they have no comprehension of what it is to do battle of even come under attack, in any form. It’s true. In Acts 14:22 what Paul and Barnabas were preaching to the churches of Derbe, Lystra, Iconium, and Antioch was that the road of discipleship that leads to the Kingdom of God is laid on pavement of tribulation. The Message version says “Anyone signing up for the kingdom of God has to go through plenty of hard times.” That’s pretty plain. Just like the houses in Matthew 7, each and every true disciple will be hit by the same storms. Derek Prince once said rather matter-of-factly that “if you’re on a road with no tribulation, it’s questionable that it leads to the Kingdom of God.” We must, through much tribulation, enter the Kingdom of God. So then, how does the wise man build? Very simply by hearing and doing the word and letting the Holy Spirit be your guide. We must not only be hearers of the Word but doers as well, as James states in James 1:22. But why must we be doers of the Word? Why, as James states, are those that only listen and don’t do deluding themselves? Because the word makes no promises to the hearer only, but for the doer there are promised blessings. Here James states that the hearer of the word is self-deceiving, like a person who looks in a mirror and then goes away without thinking further about his or her appearance. That sounds to me like a warning against a false presumption of salvation; that if we are not doers of the word it is as if we got saved, then just went on our own merry way, forgetting the entire experience and the follow-up that is essential! In other words, if I hear the word of God but do not do what it says, I am treating the word as if it were useless. I am deceiving myself about the very nature and purpose of the word of God. I am basically slapping God in the face and saying ‘what you have to say to me isn’t important enough for me to carry it everywhere I go and speak it with every breath I take!’ Do you think God would take exception to that? Scripture is full of examples stating that He would and does. Moses hit the rock instead of speaking to it and never stepped foot in the Promised Land. In Luke 6:46, which tells the same parable of the wise builder, there is a very important addition. Jesus says ““Why do you call Me, ‘Lord Lord,’ and do not do what I say?” so it is totally contradictory to call Jesus Lord and not do His word. This is as if to say ‘how can you say you’re saved, call me Lord and NOT do as I command?’ The very title of Lord, means “someone who is to be obeyed”. This is from the original Koine Greek. The personal name of God, Yahweh, in Greek is kurios or kyrios and when translated into English is Lord or Master. It is an exercise in futility to call Jesus Lord and not follow His examples and His commands and this statement in Luke warns against simply having a verbalized confession with no influence on how you live your life. This says quite plainly that believing, knowing who Jesus is isn’t enough. James 2:19 tells us that “even the demons believe and shudder”. Is a demon saved? Why not? It says that they believe? If we believe aren’t we saved? Romans 10:9 says that if we confess Jesus as Lord and believe that He was raised from the dead, then we’re saved, right? The demons know that Jesus was raised. In Mark 1:24 the demon in the man at the synagogue confesses Jesus as the Holy one of God? Are you thinking? What’s the difference? The difference is this: Receiving Jesus as Master or Lord means that our constant overriding goal in absolutely everything we do is obeying ALL His commands. And nothing else matters. Jesus’ last command in Matthew 28 is to “Go therefore and make disciples of all the nations, baptizing them in the name of the Father and the Son and the Holy Spirit, 20 teaching them to observe all that I commanded you; and lo, I am with you always, even to the end of the age.” We are to obey, observe and to teach ALL of Jesus’ commands or we are incomplete. There is another thing different about this telling than that found in Matthew 7. 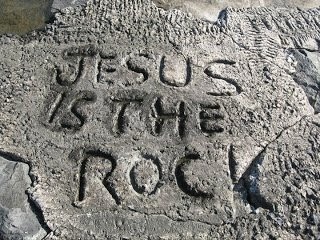 It says that the man who laid his foundation on the rock (petra) had to dig deep. He had to clear a lot of pebbles and debris out of the way in order to reach the bedrock. The same is true with a lot of Christians as well, especially those that were raised in a nominal Christian culture. In a way the person that has had no Christian upbringing at all has an advantage on grasping the solid foundation when they come to truth. They will definitely have challenges but the challenges they have are different than the person that has a lot of badly taught clutter in the basement. They will have to break through the concrete covering that they thought was the bedrock to get through to the real bedrock. We all, no matter what our backgrounds, must be sensitive to the Holy Spirit when He speaks and guides us on our way to laying a solid foundation. 1) Bad Traditions – A ‘bad tradition’ is any tradition that is not in line with scripture. In Mark 7:13 Jesus tells us that we nullify or invalidate the word of God by our bad traditions that have been handed down through generations. This is true not only of the Jewish people but also of Christians in the things we do and the words we speak at times – not to mention the celebration of Christian holidays with strictly pagan backgrounds, but I’m not going there. 2) Prejudices – Here I’m talking about a variety of prejudices – racial, cultural, denominational, social prejudice, personal prejudices, etc. When we prejudice we put people in a box. When we hear someone is a Catholic, for example, we immediately develop an attitude against them without even meeting them as an individual. I’ve been just as guilty as anyone when it comes to denominational prejudices. There are social and personal prejudices. We all have our quirks, and likewise we all have our personal prejudices. Some people automatically don’t like people with red hair or very short people. There are all kinds of personal prejudices. What command of Jesus does being prejudiced break? Being judgmental! Luke 6:37 states clearly that if we judge we will be judged harshly; condemn and we will be condemned. We must get past our prejudices and pardon so that we are pardoned. But we automatically start thinking ‘this guy is going to be this way or that and it’s just so wrong’ and so on. But the rule of thumb should be not to judge anyone until you’ve met them…then judge away! J Just kidding. But being non-judgmental and treating people openly and giving them a chance will yield plenty of surprises I guarantee you. 3) Pre-conceptions – The first cousin to prejudice, a preconception is a partiality that prevents objective consideration of an issue or situation, which is based on some prior experience with something or someone of the same type. But I want you to think in terms of how people relate to being a Christian here. Non-Christians have some preconceived ideas when defining Christians. They thing we’re all stiff and miserable mainly because that is what the non-loving Christian shows them. I’m talking about the Christian that shows up at a gay rally with placards with Bible verses on them telling everybody they’re going to hell. While that’s true it certainly isn’t the way to lead them to Christ. I believe the best way to handle any situation is to ask yourself, ‘What would Jesus do?’ I know that sounds cliché but it’s the only way we can act in a manner that shows non-Christians the love of Christ, amen? So, don’t be one that feeds the misconceptions of what Christians are about. 4) Unbelief – This is one of if not the most dangerous condition to be in. When we met for prayer before the meeting tonight one of the first things I did was to renounce and cast out any spirit of unbelief. Unbelief is crippling to any body and spreads like cancer. 5) Rebellion – We are all rebels. Every single descendant of Adam is born with a rebellious spirit that we must overcome in order to be saved and accept all of Jesus’ commandments. Do you know what the remedy for rebellion is? Death! The fact of the matter is that the execution of rebellion took place at a place called Golgotha going on 2,000 years ago. But we still have to recognize the rebellious spirit in us and come to the foot of the cross and lay it down at the feet of Jesus, and He will deliver us instantly. The key is that we must willingly submit to execution. There are obviously more than these five but you get the picture. I would certainly add rationalization to this list. Rationalization is so common a crutch in mankind that we can hardly go a day without making several excuses why we can’t do something. In Luke 14:15-35 Jesus tells us in four short parables; the feast, the tower, the king preparing for battle and the salt, that those who make excuses for not committing to Him will be ‘thrown out’- and He ends it with “He who has ears to hear, let him hear”. We must hear and do or we will not ‘endure to the end’. First, understand that what Jesus was referring to was the fact that if the OT uses the word “Gods” (Psalm 82:6 - Elohim – plural) when referring to men who were representatives of God, then the Jews shouldn’t oppose Him for calling himself the Son of God. But the most crucial line here is at the tail end of verse 35, “If he called them gods, to whom the word of God came and the Scripture cannot be broken”. Revelation 19:11-13 tells us exactly this. “And I saw heaven opened, and behold, a white horse, and He who sat on it is called Faithful and True, and in righteousness He judges and wages war. 12 His eyes are a flame of fire, and on His head are many diadems (crowns); and He has a name written on Him which no one knows except Himself. 13 He is clothed with a robe dipped in blood, and His name is called The Word of God.” Jesus was the Word, is the Word and will always be the Word – the same yesterday, today and forever! Now here’s something I want you to pay attention to please. There is total agreement between Jesus and the Bible. Your attitude toward one is exactly the same toward the other. Arguing with the Word of God is the same as arguing with Jesus. Not believing the Word of God is not believing in Jesus. You cannot believe in Jesus and disbelieve the Bible! I want to close by giving you seven vital promises that Christ gives us in His Word. They are all found in John 14. Here Jesus is telling His disciples that He is going to be leaving them for a bit. The disciples were a bit overwhelmed and saddened by this news and it was a very traumatic time for them. But Jesus comforts them by making these promises to them. 5) John 14:16 – Christ promises that He will not leave us as orphans but will send us the Holy Spirit to be our helper, teacher and guide forever, IF we keep His commandments. “I will ask the Father, and He will give you another Helper, that He may be with you forever.” In John 16:7 Jesus says that it is to the disciple’s advantage that He leaves because if He stays the Holy Spirit will not come. 6) John 14:23 – Christ promises the love of God the Father, Son and Holy Spirit will dwell in us IF we keep His Word. **It is important to understand that this scripture was in answer to Judas question, in verse 22, regarding Christ’s statement, in verses 19-21, that He would manifest Himself to the disciples but not to the world. Judas asked how this would be done. 1) Jesus said He will reveal Himself to His disciples, not to the world. So, what separates disciples from the world? Keeping God’s word is the supreme test of love for all disciples. “If any man loves me He will keep my word” This love is the motivation for obedience, which is the key to everything. 4) Christ manifests Himself through His Word. It is by keeping His word that He manifests Himself to us…whoa! This is the most basic way that Jesus reveals Himself to all believers. 5) It says “and We (Elohim - plural) will come to him and make Our abode with him “ IF we love Jesus and keep His Word, the Father, Son and the Holy Spirit will ALL dwell in us! Do you grasp the magnitude of that statement? The truth that Elohim, the Trinity, want to come and dwell in us is awesome! Likewise, if we don’t keep His word, He will not make His dwelling place in us. 7) John 14:27 – Christ promises us His peace in place of our fears. “Peace I leave with you; My peace I give to you; not as the world gives do I give to you. Do not let your heart be troubled, nor let it be fearful.” As disciples we are not motivated by fear but by the love and peace of God. A child that is motivated by fear will change the moment he or she is out of the house and on their own. But the child that is motivated by love will remain constant in the peace that yields. Now, did you notice how many of these promises are conditional? The word IF creates a condition. IF we do this, Jesus will do that. IF we love Jesus we keep His Word. IF we keep His Word THEN He will keep these promises to us. You see, with discipleship comes responsibility. You don’t love God more than you love His Word. Loving His Word is the gauge of how much you love God and that’s how God gauges how much you love Him. It’s not complicated. You need ask yourself but one question. How big a place does the Bible have in my life? How much time do I devote to Bible study? I’m not talking about memorizing scriptures without them having meaning to you. I know a lot of people that can quote scripture at the drop of a hat but the words have no meaning. I’m talking about digging deep and breaking through the basement floor to the bedrock of the Word and really studying it. Therein lies the heart, will and love of God.